Notes are strictly communicative and may be made visible to the patron via their account on the OPAC. In the OPAC, these notes display on the account summary screen in the OPAC. 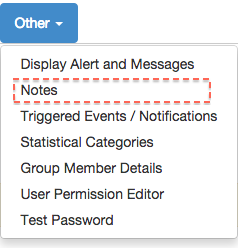 To insert or remove a note, retrieve the patron record as described in the section Searching Patrons. Open the patron record in edit mode as described in the section Updating Patron Information. Use the Other menu to navigate to Notes. Select the Add New Note button. An Add Note window displays.